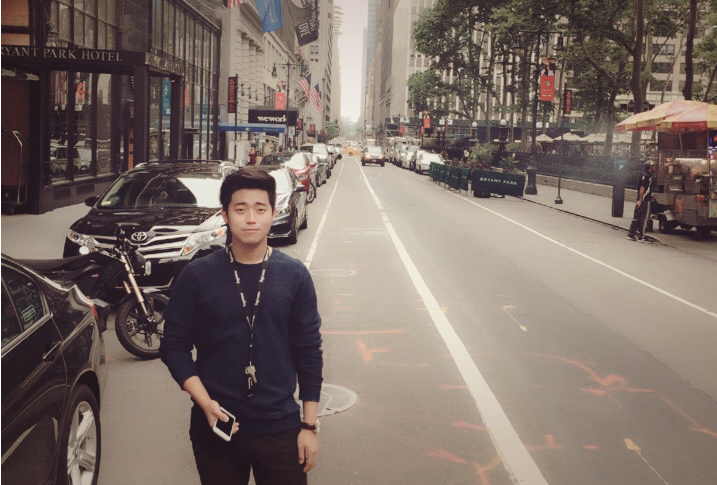 wait() & notify(): method for inter thread communication. sleep(): introducing small pause during thread execution. For example, in Producer Consumer problem, producer thread should wait if Queue is full or Consumer thread should wait if Queue is empty. For example, once producer thread puts an item on empty queue it can notify Consumer thread that Queue is not empty any more. sleep() hold a lock, doesn’t release any lock or monitor while sleeping. When a Thread goes to Sleep it can be either wake up normally after sleep duration elapsed or it can be woken up abnormally by interrupting it. While running multi-threads, there will be a significant problem when those threads try to use same resource. For example, multiple people try to deposit money into the same account. Let’s say initial balance is $0. If 5 people are accessing at the same time, they all will see $0 as an account balance. Then, after all people’s deposit of $500 each, it will have $500 for total deposit. This is because they accessed at the same time, and they all updated balance as $500. However, the balance should be $2,500. So, lock is needed to avoid other thread trying to use the same resource at the same time. That lock can be done by Synchronized. There is two ways to use synchronized. Basic types for characters, different kinds of integers, and different kinds of floating point numbers (numbers with a decimal point), and also types for the values true and false – char, int, float, and bool. All of these basic types are known as primitive types. The value of the variable is stored in the memory location assigned to the variable. For example, if an integer variable is declared as “int a = 5″, then when we look at the memory location of “a”, there will be a “5” stored there just as expected. You might be confused by all the different terminology used. 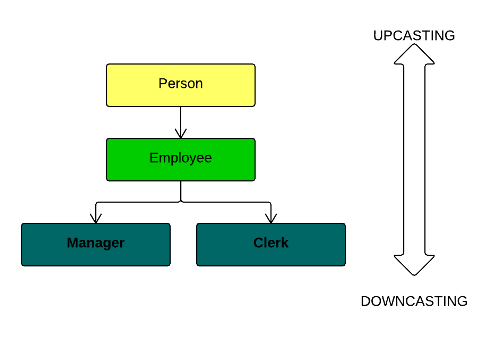 However, class types, object types, and reference types all mean the exact same thing. A variable of a reference type only stores the memory address of where the object is located. For example, “SomeClass anObject”, then when we look at “anObject” in memory, it just stores an address of another place in memory where all the details of “anObject” reside. This memory address is called a reference to the object. It will give you current time in nanoseconds(precise). Usually used for measuring performance of the code. For both, you need to Override run() method to be created as a new thread by start() call. it shares the same object to multiple threads. you can save a space for your class to extend any other class in future or now. Each of your thread creates unique object and associate with it. You can’t extend any other class which you required. 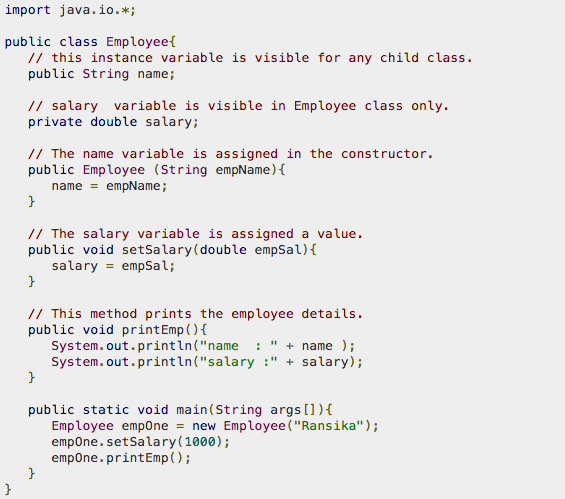 (Java does not allow inheriting more than one class). You must understand, that by casting you are not actually changing the object itself, you are just labeling it differently. Object of child class is assigned to reference varibale of parent type. You do not need to upcast manually (implicit). Employee e = x;            // Doesn't need (Employee) before the x. Object of parent class is assigned to reference varibale of child type. You need to downcast manually which subtype to downcast (Explicit). Unless, compiler doesn’t know which subtype to downcast. If subtype is different, you will get ClassCastException. To avoid the exception, you need to check which original subtype it was. Manager x = (Manager) e;       // ClassCastException. You can use instanceof if casting is possible. Local variables are declared in methods, constructors, or blocks. Local variables are visible only within the declared method, constructor or block. Instance variables are declared in a class, but outside a method, constructor or any block. The instance variables are visible for all methods, constructors and block in the class. Class variables also known as static variables are declared with the static keyword in a class, but outside a method, constructor or a block. Visibility is similar to instance variables. 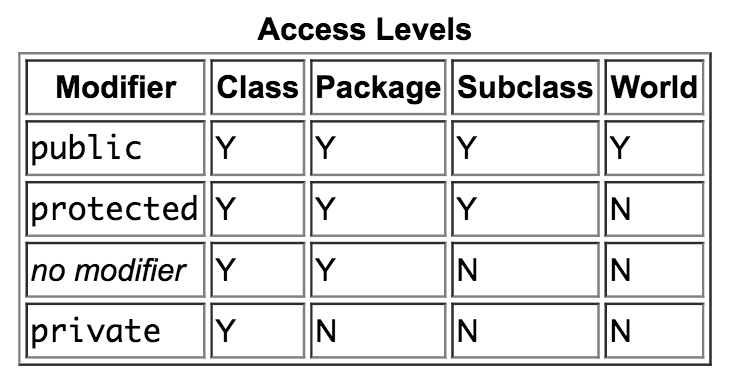 However, most static variables are declared public since they must be available for users of the class. Static variables can be accessed by calling with the class nameClassName.VariableName. public: A class, method, constructor, interface etc declared public can be accessed from any other class. protected: Variables, methods and constructors which are declared protected in a superclass can be accessed only by the subclasses in other package or any class within the package of the protected members’ class. no modifier: A variable or method declared without any access control modifier is available to any other class in the same package. private: Methods, Variables and Constructors that are declared private can only be accessed within the declared class itself. Asynctask starts with execute() method. 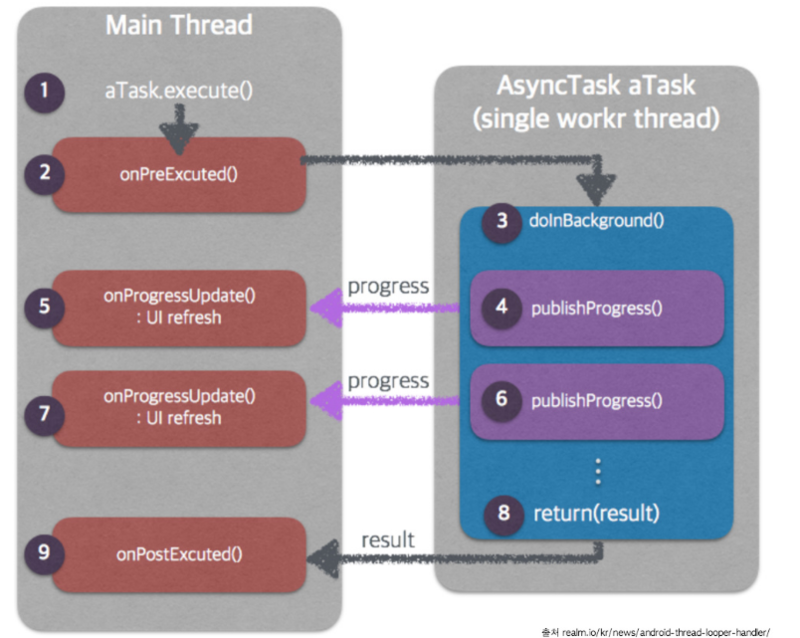 Before starting Asynctask background, onPreExecuted() executes first. Usually, people put loading images. Doing background work in new thread, gets parameter when execute() was executed. in doInBackground(), process status is updated by using publishProgress() method. onProgressUpdate() is automatically called whenever publishProgress() is executed. After doInBackground(), result parameter is returned to onPostExecuted(). With the result value, you make code which is executed after thread process is over. The main point is onPreExecuted(), doInBackground(), and onPostExecuted(). Params: doInBackground()’s parameter type, and execute() method’s parameter type. Progress: When doInBackground(), process unit type which is onProgressUpdate()’s parameter type. Result: return type of doInBackground(), and parameter type of onPostExecute().